I hate to throw anything even remotely usable away, but I know that I will not remember to rummage through my tangled thread monster for a particular shade of thread when I am working on an embroidery design, so the solution—for me—has always been to create a project specifically to use up my leftover threads. Years ago I drew diamonds on an A4-sized piece of white linen using gold gutta, and whenever I had time to kill I would take some leftover thread and fill a shape or two in with satin stitch. I ended up turning the finished piece into trading cards and swapping them away. I only have this one crappy photo, pretty much to scale, but you can see what I mean. A simple geometric grid on the fabric (old white cotton bedsheets, in case you were wondering)…nothing too complicated. Inch-sized squares halved on the diagonal. I’ve kept each shape smallish, just the right size to use up the verious 16-inch lengths, 3 or 4 threads to a skein, of each color. Any bigger and I would have to pull fresh thread from the other piles, and I am trying to use the snarl up, not create more leftover thread. 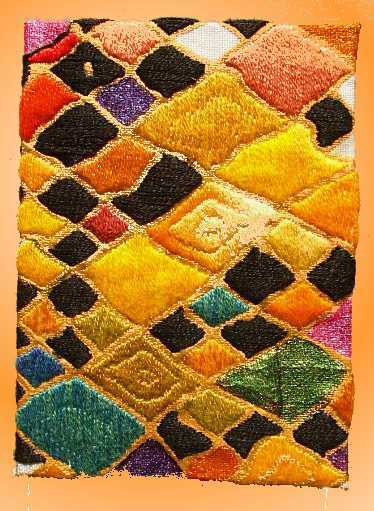 I’ve filled the triangles with a simple satin stitch…alternating between horizontal and vertical stitching gives textured patches of glossy and matte threads. I started out by using the regular satin stitch, but realised that some of my thread lengths were so short that I wouldn’t have enough to fill even one triangle, so I shifted to surface satin stitch—leaving almost no thread on the back of the embroidery. Once I use up this tangle of leftover threads I hope to always keep a piece of fabric, with a simple grid like this, ready in a hoop, so that I can stay on top of the thread situation, working a triangle here and there alongside my real embroidery projects. It doesn’t really matter that I don’t know what I’m going to do with this piece of cotton when it’s full of embroidery…there are a million ways it can be used, and I’ll just decide that when it’s done. How did I not think of this!? 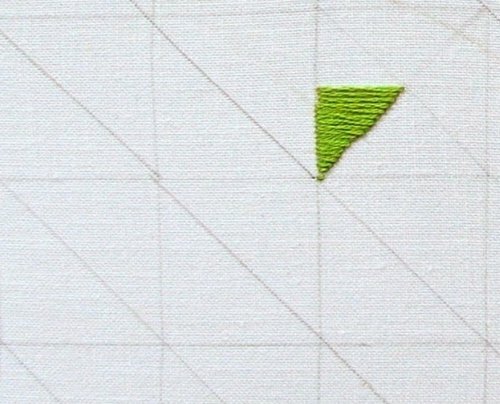 I am currently using embroidery threads to fill in plastic canvas (needlepoint). What I’m going to do is use the thread to sew squares of yarn I knitted together. THEN the leftovers will probably be used to make needlepoint coasters using random colors (like a rag rug). This was so brilliant and mesmerizing. Like the idea of keeping one ready at hand to work as I work on a project. fantastic way to use up thread! i always have tons of bits leftover, and like you, i hate to toss it. 🙂 thanks for sharing. Looks gorgeous! I’m (very slowly) beginning to stitch things myself, so it’s lovely to see that other people are experimenting with sewing too! This is lovely. I didn’t know there was another version of satin stitch (although I’m not an embroiderer so it’s probably not that shocking!). 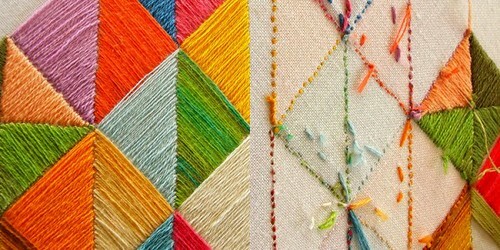 There’s something really lovely about the stitch and the shapes. One day, when I’ve finished all the other things on the list, i must try it! Cheers, Jen! Thanks for visiting! I just arrived here by chance… What a beautiful blog! Congratulations. This is so simple and so pretty! I love it! I think I will try this out. I mostly quilt rather than do embroidery, but have started playing around with quilting using embroidery floss. Have a go, for sure! Compared to quilting it’s like decorating a cake with bags of icing…instant gratification! Thanks for visiting. Thanks! It’s such a simple thing, really, surprised (but grateful!) that everyone likes it so much! What a natty idea! 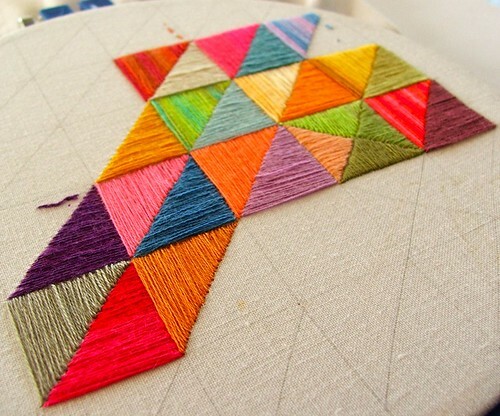 Wonder if it would work as well with a mixture of threads………..embroidery and perle for example! After using thread/wool from a new hank I wrap the leftovers on cardboard.I write on it the brand and the corresponding #, so if I need more I have the info ready. I store these in the plastic zip bag of the same color, so I never have thread bunnies. 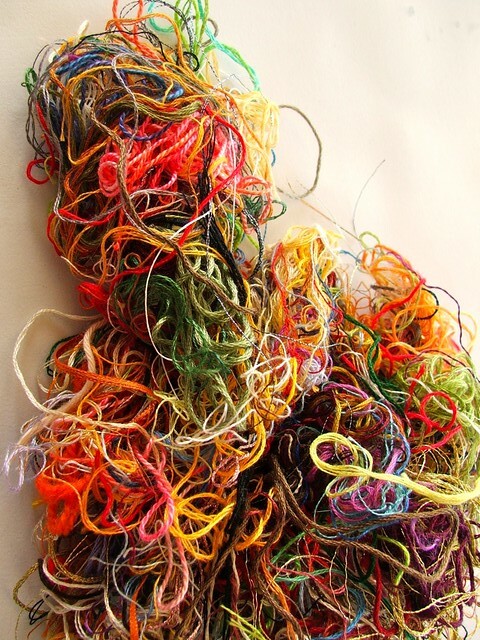 I save all my warp ends and they look very much like your thread bunny. Connected with your blog through Pinterest and look forward to following your creative hands. Thanks, Lulu, will come check out your pins on Pinterest soon! Such a brilliant, brilliant idea! Thank you for sharing! fantastic stuff. I love what u do…! u are a woman after my own heart. I have thread bunnies too but i didnt know that is what they are called.About to start a sewing program at Anula School where I teach visual art. 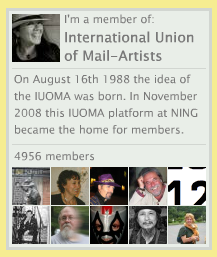 Thank you for the visit and comment, Urshula! That much, huh? Oh dear, that’s a lot of satin stitched triangles…maybe softie stuffing is the answer? I looooove this. I usually just toss old thread into my softie-stuffing jar, but I might save the longer pieces for something like this. It looks like a great way to practice satin stitch, too. Which I definitely need. For sure, a few of these and you’ll be reigning mistress of the satin stitch! Softie stuffing, that is such a good idea, didn’t occur to me (I don’t have that much leftover thread, and don’t do many softies…but I could, in the future.) Good to know. thanks! Oo nga, ‘no? Funny, that. Practice ka naaaa!